Foxpass is excited to officially announce some new features we’ve rolled out over the past few weeks as well as some upcoming features we have in Beta. Admins can now set a reauthorization timeout for their Radius clients that support the "Session-Timeout" RADIUS response. This requires endpoints to reauthorize with the RADIUS client after a set number of seconds. Reauthorization timeouts can be set on the 'RADIUS Clients' page. 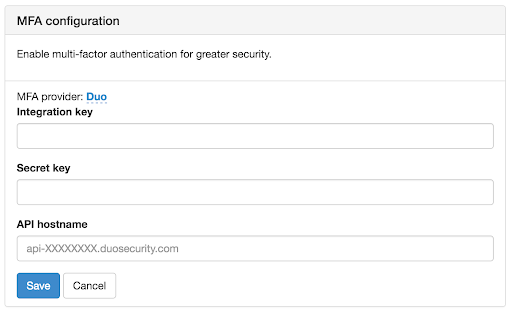 Another new feature for RADIUS clients is support for Multi-factor Authentication. MFA can be enabled on a per-client basis. Right now only the only MFA provider supported is Duo. Every time a user tries to log into the Radius client, their Duo app will ask for authorization. MFA can be enabled for a company from the 'Configuration' page after which MFA can be enabled for individual clients from the 'RADIUS Clients' page. Admins can now manually add, enable, and disable SSH keys for users. They can also mass disable all SSH keys for a user in the event that a machine or account is compromised. The 'Manage SSH Keys' feature can be found in the 'Actions' dropdown on the 'Users' page. Companies can now enable automatic Foxpass password expiration. Users will receive an email reminding them to set a new password within a week before their current one expires. If a user's password expires they can still set a new one on the 'Password' page or have an admin do it for them from the 'Actions' dropdown on the 'Users' page. Password expiration can be set on the 'Authentication Settings' page. We also have a few features that are currently in Beta and moving down the pipeline. First is LDAP request logging. 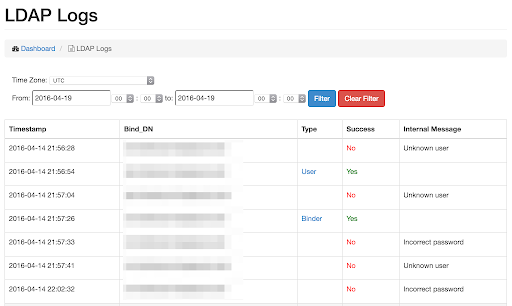 These logs are particularly useful for companies that undergo security audits. You can filter logs by time range and view the bind name, type, success status, and error message (if applicable) used in the LDAP bind request. We're also finalizing an on-premise Foxpass application using Docker. Customers will be able to run Foxpass on their own machines and receive regular updates through Docker Hub. Lastly, we're close to adding support for Office 365. Once finished, any companies that use Azure Active Directory will be able to use Foxpass. Thanks for being great customers and stay tuned for the next batch of updates!